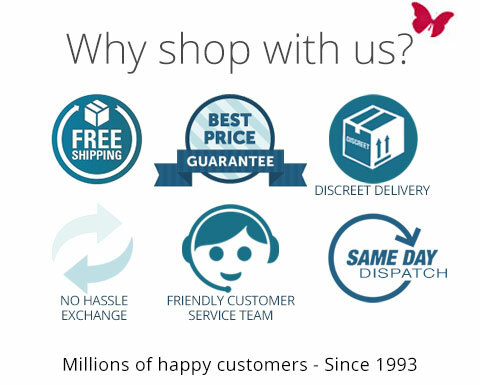 As an industry leader in online retail, we are committed to providing you with not only high quality products, but also excellence in customer service. We've built a reputation as a trusted and respected source of products in this industry so you can rest assured that ordering from us is safe, secure and private, whichever payment option you choose. * All purchases are made via a secure server. * Your details remain confidential at all times. * Your information will not be shared, passed on or sold to anyone outside of business. This information will always remain with us confidentially. Any issues relating to this site, including purchases, payment, packaging and contacts, are discreetly and confidentially handled. For more information, view our Privacy & Discretion page. * Play Now - Pay Later Afterpay (Australian orders only). For your privacy, the transaction on your credit card statement will only state 'Excite Online Services' and will not include any reference to the product(s) purchased. For your privacy, the transaction on your PayPal statement will only state 'Excite Online Services' and will not include any reference to the product(s) purchased. Contact your bank, credit union or building society for telephone or internet banking access if you do not already have it. If payment is not received within 5 business days, your order may be cancelled. Orders will be dispatched upon bank clearance of funds (usually 3-5 business days). Please make you cheque or money order payable to: Excite Online Services Pty Ltd. Please write your order number on the back of the cheque or money order and attach a printout of your order confirmation. Your order number will be stated on your order confirmation form. An order confirmation form will be automatically emailed to you once your order has been submitted. Please ensure your payment is sent as soon as possible. If payment is not received within 5 business days, your order may be cancelled. Orders will be dispatched upon receipt of funds. Funds must be transferred as soon as your order is placed. When transferring funds, use your order number as the reference number. * Use zipPay credit at any online store. * No interest, no additional fees if you pay on time. If you have any questions about ordering your product, please contact our friendly customer service team via email, phone or live chat. Visit our Contact Us page for details.